The "Every 15 Minutes" presentation at Hart High included the Grim Reaper collecting students as those killed in fatal DUI crash. The presentation is intended to deliver an emotional message to students about the potential dangers of driving while under the influence. Last week, Sheriff Alex Villanueva and over 700 community members joined together for the ‘Violins Not Violence Mariachi Concert’ at the Downey Theatre tonight. The sold out concert brought several different law enforcement officers from throughout SoCal together for this benefit concert. A man was arrested for attempted murder after a stolen car slammed into a 24-hour gym in La Mirada early Tuesday morning, and authorities are investigating the possibility that the crash was intentional due to a grievance held by the former member. 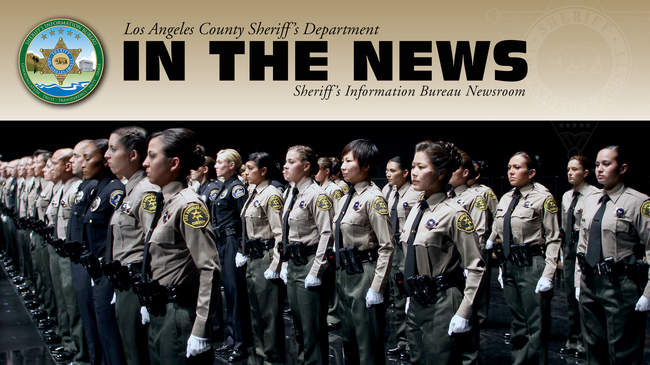 Los Angeles County Sheriff’s Department Mental Evaluation Team (MET), in partnership with the Los Angeles County Department of Mental Health, and Los Angeles County Military and Veteran Affairs, conducted a training seminar to teach deputies practical verbal skills in dealing with mentally ill patients. An hourslong barricade situation in Palmdale ended Sunday morning with one suspect dead. The situation began after 9 p.m. Saturday when deputies responded to Karling Place. No deputies were injured during the situation. Four documented gang members were charged with murder in connection with two Artesia shootings, one of which was fatal.